Description: The action franchise that started it all is celebrating its 20th anniversary with an all-new adventure on Nintendo DS! 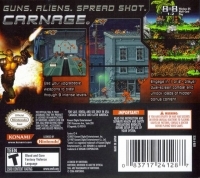 Set after the events of Contra III: Alien Wars, the game follows mercenaries Bill Rizer and Lance Bean as they battle to save the world from a new extraterrestrial threat. 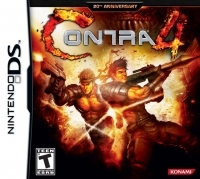 Contra 4 takes advantage of the dual screens of the Nintendo DS to deliver larger than life action, with massive enemies, detailed platforming and mind-blowing set pieces. Box Text: Guns. Aliens. Spread Shot. Carnage. 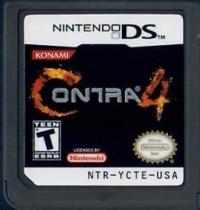 This is a list of VGCollect users who have Contra 4 in their Collection. This is a list of VGCollect users who have Contra 4 in their Sell List. This is a list of VGCollect users who have Contra 4 in their Wish List.